Kumquat, glucose, maltose, salt, acidity regulator: E509, sulfur dioxide. May contain traces of PEANUTS, SULPHITES and NUTS. coloured like orange-red, the shiny smoth Kumquat it has its roots in Vietnam and China. Usually, it is known to many as kumquat. Despite their similarity in shell and colour, belongs, strictly speaking, not the citrus, but is botanically related to them. They taste gorgeous lemony, spicy and slightly sour and it used to be consumed along with the dish. 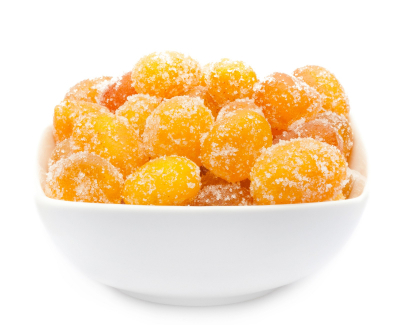 Kumquat is also recommended by their content of provitamin A, vitamin C, calcium, and potassium. KUMQUAT DELUXE has been carefully candied and dried. Through this pure process, they have lost nothing of their original fruitiness, of gorgeous citrusy touch or even its colour brilliance. Who does not know KUMQUAT DELUXE, should change this quickly! Yhe fresh Kumquat you can find in the meantime in almost every supermarket. The Mediterranean citrus with its exceptional taste also looks very decorative, for her pretty yellow-orange colour that makes a gorgeous bright scene, which makes it a pretty eyecatcher. It's a special tasty highlight of the KUMQUAT DELUXE because they wonderfully concentrated inside the fruit through the process of candieding and drying, its luscious fruit flavours and have lost nothing of their original flavour. Try this delicate snack and let yourself be enchanted by the lemony-sweet flavours of this extraordinary fruit. As so often in life, the first impressions count. Visually, our KUMQUAT DELUXE are now no major fruits, behind which one can expect a huge flavour packet. If you have the first fruit, however, only in the mouth, cut them carefully with your teeth, and you will feel the fruity explosion which unexpectedly meets a, first barely that you won't be able to believe. This fruit has everything you could wish from an exotics-only can hope: there is only this gorgeous crunchy sweet sugar crust with a perfect bite, then the lemony-orange fruit composition pours soft and hard about the whole taste buds. A delightfully fruity snack that is fun while enjoying.